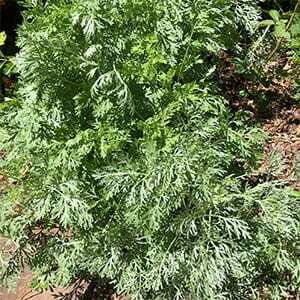 One of the most widely grown of all of the wormwoods is Artemesia ‘Powis Castle’. Grown mainly as a foliage plant and regarded as one of the best grey or silver foliage plants of all. Originating from Wales where is was identified as a distinctive cultivar at ‘Powis Castle’, it carries the name. An evergreen perennial that grows well in sunny positions it will reach around 1m in height. The foliage is fragrant and is also finely dissected, along with the silvery appearance makes it a most desirable plant for the garden border. Full sun to part shade and a humus rich soil is best. 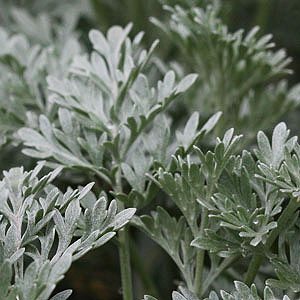 Artemesia ‘Powis Castle’ will cope with dry conditions however a little mulch to help maintain a cool root run is beneficial. Deep shade is not suitable as the plant tends to become very leggy in these conditions. Start by removing any dead or damaged wood and then prune back to shape. Can also be tip pruned or pinched back in spring. How to Prune Artemisia Powis Castle and other species. 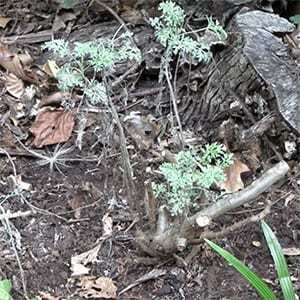 Artemisia respond well to pruning, and annual pruning in spring is the easiest method. This can be a fairly compact plant, however over time it will require pruning to maintain shape. For annual pruning, simply use hedging shears or secateurs and prune back about 1/3 of the growth. It can be cut back in early spring after the danger of frosts haves passed. The second type of pruning is a little more brutal, and older plants that need rejuvenation can be treated this way. You will notice shoots from the base, and you can prune back hard if the plant has become unruly. The time to prune is in late winter to spring, just as the weather warms a little. Use a sharp pair of loppers or secateurs and cut the whole plant back to around 6 inches (15cm) above the ground. Make sure the cuts are clean to prevent disease and splitting. Don’t worry about hard pruning. Most times the plant will bounce back with masses of new growth. Fertilise, water and mulch after pruning. Follow up with a light pruning mid spring after the plant has put on new growth. This will encourage a bushy better shaped plant. 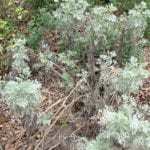 Common names – Wormwood, Silver Sage. Pruning – Prune back inmate winter to spring.